WHY NINE CANDLES FOR CHANUKAH? Every time I open my Word program on my laptop, I am confronted with a directory named “Nine Candles.” In it are two files for a long-time work-in-progress, a requested outline and partial manuscript for a question-and-answer book called Why Nine Candles for Chanukah? It was requested and then unrequested by a publisher who had released a similar Q&A about Christmas. The editorial board later decided there wasn’t enough of an audience for such a book, I suspect because the Christmas one didn’t sell well. So what to do with a WIP that was already nearing completion? At least I had asked all the questions, and knew the answers even if I hadn’t yet written them down (thus the outline part of the manuscript). Let it languish? Keep promising myself I’d finish it? Delete it? Or finally sit down, complete it, and then self-publish it as an e-book and, if there are enough requests, as a paperback? After several years of ignored resolutions, I finally stopped procrastinating and am in the process of finishing the manuscript. Or will, once I post this blog. Truth in advertising time: the number 90 is just coincidental. I can’t think of any other questions. If I had come up with 91 questions, or 102, or 73, I’m sure I could have also devised a meaningful reason to make the number seem a deliberate decision. Here’s my request: Below are the questions. Are there any others you would like answered? Please let me know in the comments below, or, if you prefer, in an email to me at rabbi.author@yahoo.com. And I promise the answers will be accurate. Or as accurate as 65 years of celebrating Chanukah, 2 years living in Israel, 5 years of rabbinical training, and Mr. Google can make them. Why are there so many different spellings of Chanukah? Why does the English date of Chanukah change every year? Why does Chanukah last eight days? Did the oil really last eight days? How did the story of the oil originate? Are there other explanations for why the holiday lasts eight days? Why is there a ninth candle on the menorah? Why are there menorahs with eight candles? What are the different customs for lighting the menorah? When is the menorah lit? When is the menorah lit on Friday night? What are the prayers for lighting the menorah? What is the difference between Ma’oz Tzur and “Rock of Ages”? Is there any other meaning of the word? What is the origin of the holiday? What is the meaning of Maccabee? How did the Maccabean revolt begin? Were the Maccabees fighting for religious or political freedom? What are the different parts of the Hebrew Bible? Is there an easy way to remember the contents? Why is the Book of Maccabees not in the Hebrew Bible? So then where is the Book of Maccabees? Who were Judith and Holofernes? What is the Scroll of the Hasmoneans? Is there outside corroboration for the story? What did Josephus write about Chanukah? Is Chanukah mentioned in the Christian Bible? What is the difference between a Holy Day and a holiday? What other minor holidays are celebrated in Judaism? Why is Purim in the Hebrew Bible and Chanukah is not? If Chanukah is a minor holiday, why is it so widely celebrated? Are there special synagogue services during Chanukah? Do observant Jews work on Chanukah? How was Chanukah celebrated in the Middle Ages? How is Chanukah celebrated by Sephardi Jews? How is the dreidel game played? Is the game played differently in different cultures? Why do Jews eat latkes on Chanukah? Can latkes be made from anything besides potatoes? Why the differences in preferences? Why is cheese another traditional food for Chanukah? What do donuts have to do with Chanukah? How did chocolate coins become traditional? Is there a connection between Chanukah and Christmas? Why is the 25th of the winter month important? Why are lights important to both holidays? Why are gifts given on Chanukah? Are there ways to avoid the gift-giving frenzy? Are there any other gift giving holidays in Judaism? What kinds of Chanukah decorations are there? What is a Chanukah bush? Back to work. As they say (do they? ): So many questions, so little time. Join me and other NJ authors (and publishers!) at the first Belmar BookCon, Pyanoe Plaza (the brick pathway at Main Street and 9th Ave), Belmar, NJ. Sunday, Oct. 12, 10am-4pm. I’ll be selling, signing, and shmoozing. 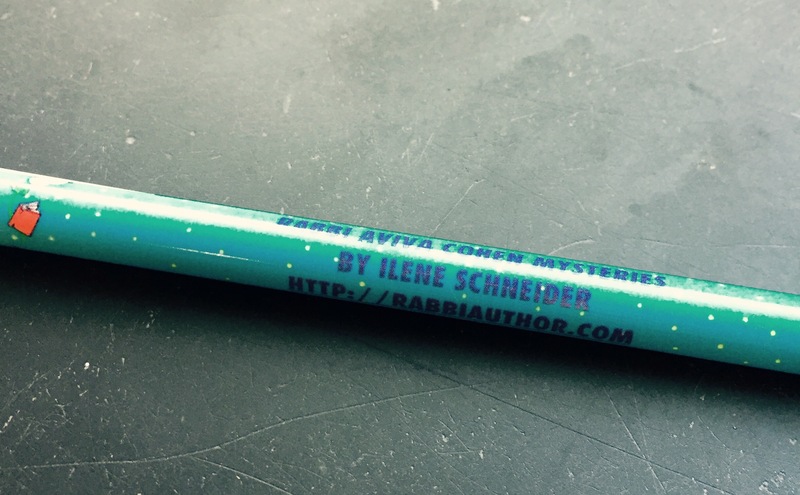 And if you sometimes need to write something by hand, I have pens (imprinted with my website/blog address, of course).